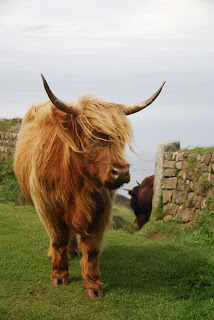 At Cape Corwall there is a project to bring back more native wildflowers... the solution; Highland Cattle. These docile little gramnivores keep the grass low and allow wildflowers to thrive, plus they are really rather cool! They don't object to the wild coastal weather either being bread for the Scotish Highlands.